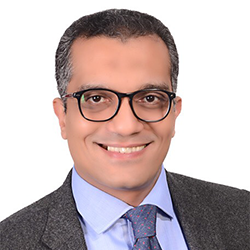 Born in Cairo-Egypt, Dr. El Beltagy completed his studies in Medicine and received his MD from University of Cairo, Egypt where he is currently a full professor in the department of neurosurgery. In 2001 joined the training program of neurosurgery in Frankfurt am Main University, Germany. In 2003 joined the neurosurgery department in Zurich University, Switzerland where he completed his training and european board of neurosurgery. In 2008 established and directed the neurosurgery department in the Children’s Cancer hospital of Egypt where he is currently serving as the head of the department of neurological surgery. In 2010 received a Fellowship award from the AANS in pediatric neurosurgery in Boston Children’s Hospital, Harvard University, USA.